If you prefer to build your own pool we are pleased to offer a complete design and installation service for the specialist equipment. 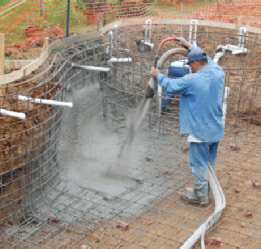 For outdoor pools this may include the filtration, heating and chemical systems, along with the lining or tiling to the pool. For indoor pools this could also include the air-handling systems, along with other features such as spas, saunas and steam rooms. As each project is different, we would suggest that you contact us at the earliest stage of your project, to receive the very best advice. At Lennox Leisure we are committed to offer a full support service to our clients. From routine maintenance to equipment replacement, our experienced pool engineers can provide the service you require. If you have a particular problem, please give Steve a call to discuss this, and to arrange for any work to be carried out. For the successful operation of your outdoor pool it is essential that it is maintained in an ideal condition throughout the winter months, when the pool is not in use. We are pleased to be able to offer any help you may require with this, from simply dealing with the filtration and heating systems, to complete service and clean-up of the pool. Having this work professionally undertaken will give you the peace of mind that your pool will be in an ideal condition when you wish to use it. Another major part of our work is the refurbishment of existing pools. Unfortunately at some stage your pool may begin to look old and tired. Whilst in some cases a good service and clean up will produce the required results, others may require more extensive work. At Lennox Leisure we have over 30 years of experience in refurbishing all types of pools. Please give Bryan or Steve a call to discuss how best your pool can be brought back to an ideal standard. Leaks come in all shapes and sizes, and you will be very lucky if you don't have this problem at some time, even if it is just a leaking seal on your pump. Whilst some leaks are easy to spot, others are anything but. Often the diagnosis is more time consuming, costly and frustrating than the cure. The nature of the leak may depend on the type of pool and equipment you have. Rather than give a long list of things to 'have a go at', why don't you give us a call to discuss this. If you answer a few of our questions, we will be better able to answer a few of yours. Some of the things we will suggest, you could try yourself, which will save time and money. If these don't work, we have many procedures and techniques to find out what is causing the leak. If you do call us, it is best if you are at home, with a cordless or mobile phone. We may ask you to have a look at a few things, while we speak. Perhaps the service we are most proud of is where we are able to offer advice to clients directly. We accept that some problems you may have with your pool can be dealt with by yourself, saving time and costs. In these instances we are pleased to offer advice over the telephone. If you think this could be the case, simply give Bryan or Steve a call. The best advice we can give in response to any question you have regarding pools is to give Steve or Bryan a call on 01943 876676.